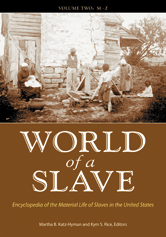 Editors: Katz-Hyman, Martha B. and Rice, Kym S.
Recognizing that a full understanding of the complexity of American slavery and its legacy requires an understanding of the material culture of slavery, the encyclopedia includes entries on almost every aspect of that material culture, beginning in the 17th century and extending through the Civil War. Readers will find information on animals, documents, economy, education and literacy, food and drink, home, music, personal items, places, religion, rites of passage, slavery, structures, and work. There are also introductory essays on literacy and oral culture and on music and dance.